One week, the vessel is transporting coal – the next, it is grain. NOR- DEN’s dry cargo vessels are versatile cargo ships that can transport basicly anything that can fit into a cargo hold. It does, however, require some preparation to switch from e.g. coal to foods such as soya bean, grain or other edible prod- ucts. Preparations which include thorough wash-downs and cleaning. Until recently, this process has been both laborious and, at times, dangerous and time consuming, as it has required skilful employees to clean the cargo holds with high pressure cleaners and chemicals while being suspended from the hatches above. But this process may soon be a thing of the past. of the holds while pressure cleaning them. It is the Danish company CLIIN that has developed the robot which in the course of 2018 and with assistance from the Market Development Fund has been tested as a prototype on one of NORDEN’s vessels. 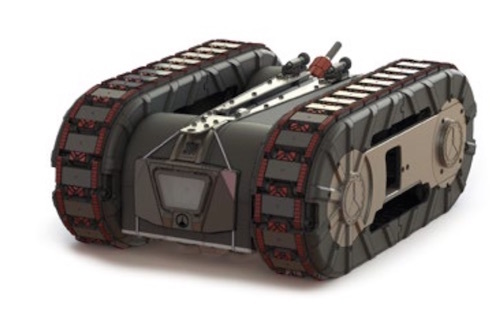 The robot is driven forward by belts that are magnetic and therefore stick to the sides of the vessel. On top, there is a holder for the high pressure cleaner which can be turned individually. “Preliminary results with the robot are positive. The robot is easily operated and also reaches those places that can be difficult to get to. I have seen many robots in the market, but this one is a qualified suggestion for how cargo hold cleaning in the future can be done in a better, more safe, environmentally friendly and quicker way, and it’s about time. It is pretty much the same method being used to clean cargo holds today as it has been for the past 20-25 years,” says Jo-nas Warming, Senior Optimisation Manager, who has followed the developments closely for the past few months. In addition to better safety by no longer requiring people having to be suspend- ed from above, the robot is also more environmentally friendly in how it cleans the cargo holds as it does not require as much water or chemicals. Until now, crews have had to complete up to 4 wash-downs to clean the cargo holds. First salt water, then possibly a chemical solution, then salt water again and in conclusion freshwater. With the robot, it can be done with just 1 wash-down of freshwater as the robot is equipped to apply higher water pressure closer to the surfaces that need cleaning. It is expected that the robot will be ready for operation on board a selection of NORDEN vessels during the autumn of 2018. And NORDEN and CLIIN will continue working together to further develop the robot.